Google Earth is a map application designed to render a 3D representation of Earth on the basis of satellite imagery. It is available for users to fly on the earth to a specific location, seeing cities and landscapes from any angles. Only with your mouse, you can explore the globe at discretion. How cool it is to record your tour on Google Earth in 3D view! But it is the privilege for paid users of both Google Earth Pro and Google Earth EC, who have been charged in high fee. Supposed that there is no access for free users, we will list two economical ways to benefit you and guide you how to record Google Earth clearly. Equipped with the most advanced capturing technology, Joyoshare Screen Recorder is more dedicated compared with other similar capturing programs. It enables you to record your movements on Google Earth and produce a high-quality captured video for you. When make use of this excellent recording tool, you can grab both video and audio synchronously, meaning any microphone and system sound can be captured flexibly. 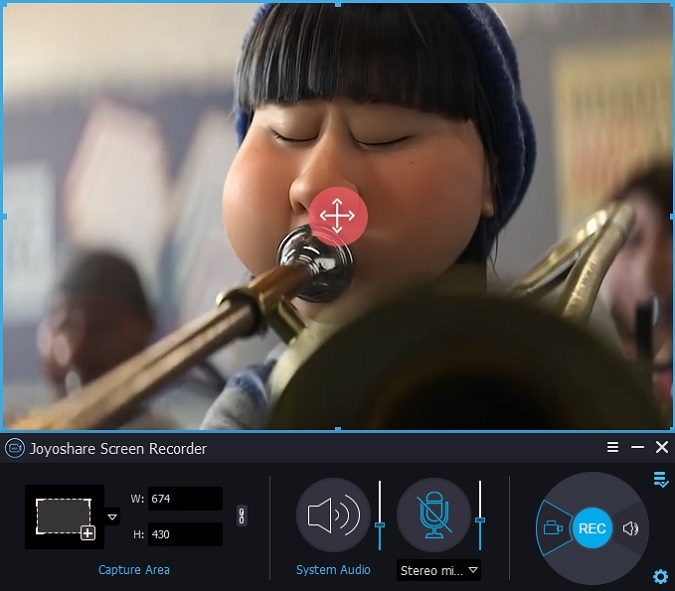 Joyoshare Screen Recorder also includes comprehensive support to save Google Earth video to any feasible format as well as device, for instance, MP4, AVI, FLV, SWF, MPEG, WMV, MKV, MOV, iPhone, Andriod, smart TV, etc. Wonderfully, Joyoshare Screen Recorder also facilitates you to make Google Earth video according to your own preferences. It is capable of closing audio tracks, determining storage location, choosing output format, taking screenshots, cutting video, presetting recording task, etc. Of course, not only Google Earth video can be recorded via Joyoshare Screen Recorder. 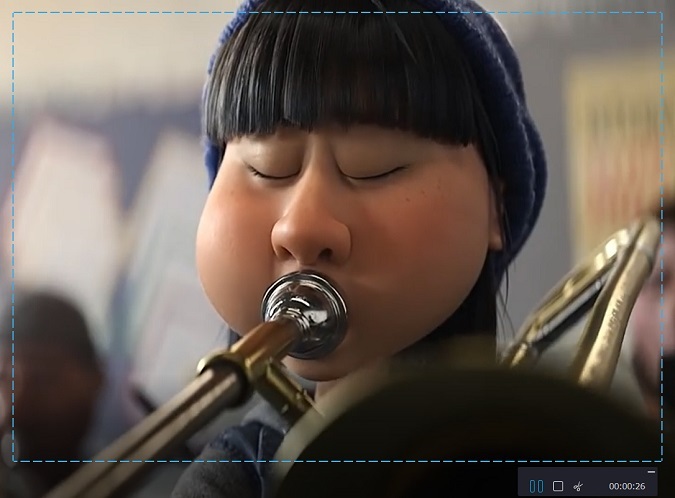 Any other desktop video can be captured for future playback as well, including GoToMeeting webinar, class lecture, Adobe Connect, Hulu video, Facebook chats, etc. Below are the complete steps to record Google Earth video with Joyoshare Screen Record. Make sure Joyoshare Screen Recorder is installed on your PC and double click the icon on your desktop to start it. Joyoshare Screen Recorder is flexible for you to choose capturing area. It empowers you to choose standard systematic ratio firstly, such as, 320x240, 640x480, 1280x720, full screen, etc. If you dislike it and would like to customize it, you can do it through enter accurate width and height number or adjust pop-up window to make a suitable position. All these three methods can be done in "Capture Area" located on the left of main interface. Click the gear icon and all recording parameters will be spread out. You are entitled to disable system audio or microphone sound in order to remove noise from captured Google Earth video. Aside from it, you can also utilize Joyoshare Screen Recorder to choose output format, create a designated capturing task, use shortcuts, highlight clicks, etc. 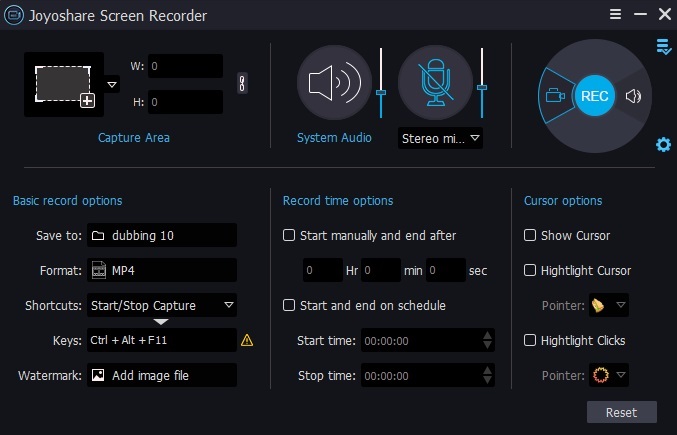 Note: Assuming that you want to use Joyoshare Screen Recorder as an independent audio capture, you can simply click the audio icon next to "REC" button. Any audio tracks, like online ratio, music games, streaming music, etc, are accessible and can be saved to MP3, AAC, WAV, FLAC, M4A and M4B. Enter Google Earth and create a tour. After that, you can hit "REC" button to start recording any movements you do on Google Earth. Joyoshare Screen Recorder will provide 3 seconds countdown to let you adjust capturing region again. 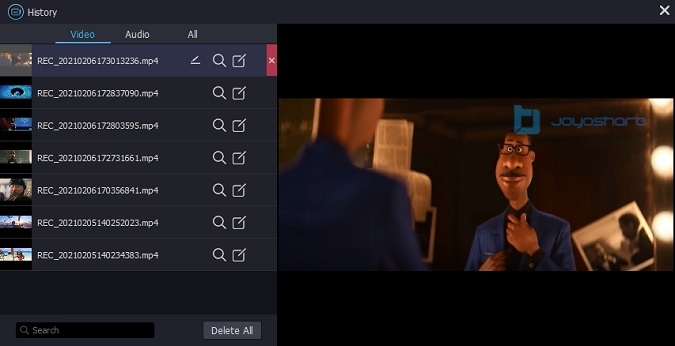 During the whole capturing process, you can cut video to different parts and make screenshots as you like. Joyoshare Screen Recorder has ability to preview and edit captured videos for Google Earth. You can play the complete video to check whether it is well-pleasing, revise its file name, add additional ID tags information, etc. The second method to record Google Earth Video is to make use of an online freeware called Free Online Screen Recorder. It is considered as the fastest way when it comes to Google Earth video captures in market. Obviously, you can directly utilize this free tool without installing any third-party program on your PC. Certainly, given that there is no cost, Free Online Screen Recorder is not professional enough to provide you with all-in-one solutions. More importantly, to some extent, online recording is easy to leak private information. Anyway, you can weigh all merits and demerits by yourself. If you are fond of this way, simply follow me to see how to utilize it to record Google Earth video. Navigate to the web page of this free online Google Earth video capture. Once you click "Start Recording", it will run automatically. Note that it is indispensable to download a smart launcher installation to active this free recorder smoothly, especially when you visit it in your first time. Then you are allowed to set up some recording options on the basis of your needs, like video format, mouse style, frame rate, etc. Open Google Earth and set recording area correctly. Press "REC" button to make Google Earth video recording. You can freely show all tour and animations on your Google Earth, during which you can have real-time edit, such as adding useful texts, indicative arrows and lines, etc. Upon you finish the recording process, go for hit "Pause" button and choose tick icon. Before it is published, you have chance to preview the video and decide output format.